"HOW AND WHY OPEN SOURCE IS AT THE CENTER OF OUR BUSINESS STRATEGY"
Mazy Dar (@mazydar), CEO of OpenFin (@openfintech) joined us for the Open Source in Fintech Event Series for May. Mazy sat for a fireside chat style conversation with FINOS’ Rob Underwood in front of a standing-room only crowd. 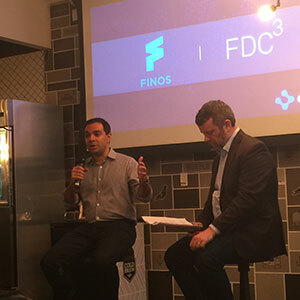 The discussion centered on how OpenFin is putting open source at the center of its overall business and market strategy and the decision to commit the FDC3 program to the FINOS Foundation. FDC3 is creating the standards to improve financial desktop interoperability, and creating value for organizations and developers in the financial industry in the process. "FINOS is very important to us. Years ago we wanted to see contributions to projects but without the proper framework and legal structure getting big banks to contribute turns out to be extremely difficult. We’re also excited the focus has expanded to all of financial services." "Turns out open source is an important factor when engineers make decisions. If they don’t have it on their resumes it results in a “gap”. So, it becomes a talent retention issue. Allowing them to contribute and providing those opportunities enables us to recruit more effectively. Open source allows big banks to recruit more effectively." "Open source results in velocity, and big banks want to see that velocity as well. The pressure to build things faster has brought the need to engage in open source to the forefront. Speed is important." "40 banks and buy side firms are now part of the FDC3 project. Multiple streams are now open. Under FINOS we now have the framework in place to allow others to step in and contribute. Nick Kolb has been heading that up, and he’s doing a great job." "I would say the technology around sales workflow and workflow automation in general. Computers having an ability to understand what’s going on then prompt the user to do something they otherwise would not have done. Some of these technologies have existed for a while stand-alone but are now coming together. Seeing the end business value is super exciting." One, maybe finserv is really not exciting enough at the moment. The challenge is to change this perception. Two, many problems that have already been solved in other industries remain unsolved in finance. The finance sector has been ignored by most big companies resulting in lots of opportunity for folks on things like messaging, voice, etc. to innovate and provide services and products. The opportunity is significant." Anyone interested in finding out more about the FDC3 project can do so by emailing us at fdc3@finos.org. Find out more about OpenFin by contacting them directly.